[Watch] ....What sends shivers down the spine of football players and fans alike? - "Hotcow Special Article"
The Champions League anthem has become one of football’s most iconic pieces of music. It sends shivers down the spine of players and fans alike, before Europe’s finest do battle. To celebrate its official partnership with the UEFA Champions League, Walkers Crisps recently unleashed a ‘Choir of Champions’ on the streets of three European cities, to get fans #GameReady for the defining stages of the competition. 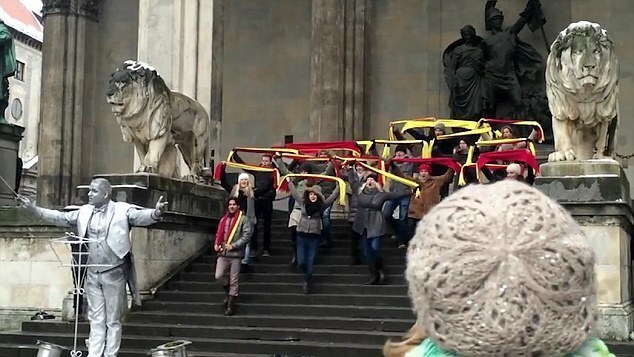 In a very clever and feel-good guerrilla marketing stunt, a series of impromptu renditions of the classic tune were performed on buses, streets, and city squares, by the Choir of Champions – who were out in full force in Madrid, Munich and London. Walkers’ long-standing brand ambassador, Gary Lineker, was involved in the guerrilla campaign. To kick-start the day, the football pundit took to the London skies in a fully kitted out helicopter, which blasted out the tune to commuters below. The helicopter landed at London’s O2 Arena, where Londoners were also given a live rendition on the ground. In addition, commuters on a London bus were shocked when members of the choir began to sing a live operatic version of the anthem, while swinging scarves – much to the delight of the driver. In Munich, a human statue street performer – covered from head to toe in silver paint, played the role of conductor as he led a choir in a flash mob rendition of the theme tune, in Munich’s busy Marienplatz square. And in Madrid, a classic Spanish kiosk was secretly transformed to surprise customers as they approached. It blasted out the unmistakable anthem whilst showering them with ticker tape and glitter. Of course, the funny sequence of events, and the reactions of those caught off guard were captured on hidden cameras, CCTV and mobile phones in each city. You can check out an edited version here. The stunt was used to create a positive buzz around the Champions League, by creating spontaneous moments of fun across the streets of Europe. This campaign had a real feel-good feeling about it – the joy of the music and surprise made people happy. This is significant, because, happiness makes us want to share. And this extends to social media sharing – the above video has been viewed 864,056 times in 6 days on YouTube. Don’t underestimate the power of happiness! Hotcow is a non-traditional creative agency that specialises in experiential marketing that goes viral. Our campaigns generate buzz through crowd participation, PR and content sharing. Contact Sally Durcan on 0207 5030442 or email us on info@hotcow.co.uk .